I’ve always been one of those people who believes that everything happens for a reason, which is crazy because I’m also the person who always has a backup plan to the backup plan. I’ve been that way my whole life and I’m not going to lie, I get a little wacky when things don’t go according to plan. I like to be strategic and move with certainty. As I finish out my MSBA summer and get more in-tune with the things I need to accomplish to succeed in the sports industry, I’m learning that your plans don’t always work out, so elevating yourself in every way possible is key. It’s only Tuesday and I have felt like the week has been dragging on. With our summer being almost over, I had X, Y, and Z things to finish out and nothing is going according to my plan. I needed to sit down and go back to the drawing board but I didn’t have the time. My day consisted of learning how to put together our Hashtag Sports Daily newsletter while cranking away at our five-star subscription database. Then I had to find a way to make it up to Times Square by 5:15 PM (in NYC rush hour traffic, yeah right) for my meeting with David Oestreicher, Managing Director and Co-Founder of MSBA, before we headed over to Bleacher Report for our Office Field Trip. I was stressing and I knew it, but when David and I both arrived at Pick-A-Bagel around 5:30 PM, a wave of ease and certainty surrounded me. We were both late and both had no clue where this conversation was going or where it would head, but here we were. As I began to tell David about my doubts and concerns coming out of MSBA and how my so-called “plans” aren’t working out – per say, he hit me with something that I had needed to hear all day: “I don’t want to be that person to tell you that you need to broaden your scope because I think it’s good that you move strategically and with certainty, but everything is going to fall into place.” Now I know the line itself might not seem all that inspiring, but this meeting with David was a reschedule from one we were supposed to have the week before. Today was the day I needed to hear that exact line and all I could think was, “wow, everything happens for a reason.” Making our way over to B/R, David continued to pour out things I needed to hear, and as we arrived to one of the most gorgeous buildings on Broadway that I have ever seen, I knew my night could only get better. Walking into B/R HQ for the second time this summer was like a dream, and despite how I was feeling in terms of stress and my plans, I knew that I was here for a reason. The night began with an exclusive tour lead by Will Leivenberg, Senior Manager of Brand Marketing. Having been at B/R for nine years, Will gave us the inside scoop on how he has been an integral part in the growth and design of B/R HQ and how much thought and detail went into each element. As I made my way through the different sports and culture-inspired rooms with my 24 other classmates, I could see the magic light up on everyone’s face, including Will’s. Trailing behind the group were B/R Social Media Programming superstars Oruny Choi and Dimetri Francis, who took over the spotlight in our panel discussion, or what I’m going to call B/R 101. Starting out with introductions and a dope sizzle video, the authenticity and passion in the room were real. Oruny and Dimetri kept it 100 with us, taking us through their backgrounds, how they ended up at B/R, and the challenges they overcome every day to keep elevating their passions to a new height. With B/R Kicks being one of those passions, we got the exclusive version of how all their hard work came to fruition, showing that – if you have passion – immersing yourself and diving in with all of what you have is the only way you will elevate that success. To keep the conversation rolling, two other B/R superstars joined our panel: Katie O’Mealia, Director of Sales Analytics and Jozen Cummings, Deputy Director of Social Stories. 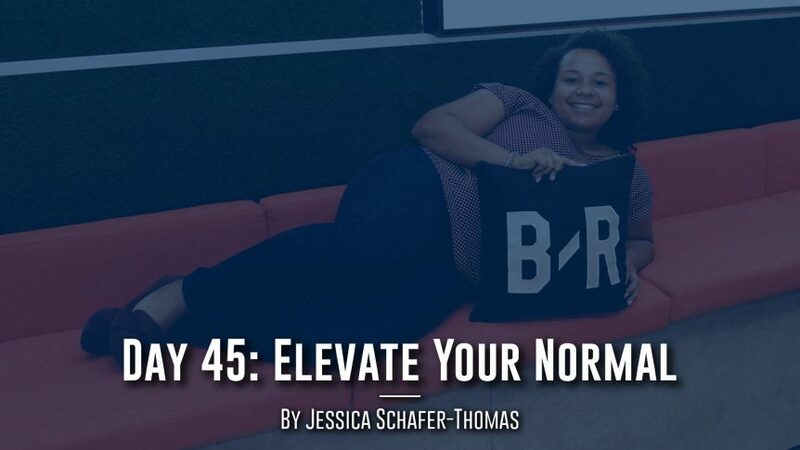 Both Katie and Jozen shared with us their background and how they ended up at B/R, while putting a great perspective on how two vastly different departments work so closely together and make B/R thrive. As they continued to hit the MSBA squad with some fire, the biggest takeaway for me was the advice they thought we needed to know. First was Jozen, whose powerful three tips included being as fluid as possible, being careful, and understanding why you want to do what you do. He was standing in front of us today because he was willing to do and try different things while still following what he had built-in interests in. He guided his navigations to exactly what he wanted. Next was Katie, whose inspiring list of six points included taking chances, investing in yourself, listening, being nice to everyone, anticipating questions, and understanding the end goal. They seemed so simple and elementary, but they had so much value. These weren’t the only awesome tips that came out of our B/R 101 panel; we also got hit with other great tips from Will, Dimetri, and Oruny. Everything that was told to us on the B/R panel were things I needed to hear today. Things I needed to hear at this point in my MSBA summer. When the time arrived to head out for the night, I instantly started reflecting on my day, realizing that everything that happened was for a reason. Meeting with David happened for a reason. Going to B/R happened for a reason. Getting assigned to write today’s blog post happened for a reason. To everyone I encountered on what I chalked up as a bad Tuesday, thank you. I needed you more than you will ever know and even though today or this past week have not gone according to my plan, I’m going to take the advice I was given and use it for my new plan, which is to elevate my normal. P.S. Thank you Jozen for giving me the perfect new plan and blog post title!